1. 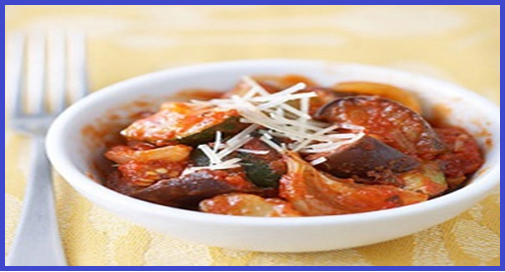 In a 3 1/2 or 4 quart slow cooker, combine eggplant, zucchini, onion, spaghetti sauce and the 1/3 cup Parmesan cheese. 2. Cover and cook on LOW 4 to 5 hours or HIGH 2 to 2 1/2 hours. Sprinkle with the 1/4 cup Parmesan cheese. Yield: 8 Servings Serving Size: 3/4 cup Per Serving. WW Plus+ = 1 Per Serving.